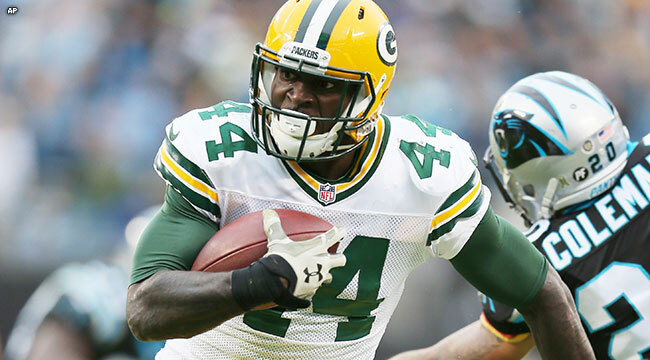 GREEN BAY — Head Coach Mike McCarthy declared James Starks is the Packers’ No. 1 running back heading into this Sunday’s game vs. the Lions. Starks has been the more productive back in recent weeks compared to Eddie Lacy, who sustained a groin injury late in last week’s game but was labeled “full-go” by McCarthy for Wednesday’s practice. Starks had three carries for 28 yards on a first-quarter TD drive last Sunday vs. Carolina, then added three screen passes for 76 yards, including a 29-yard TD, in the second half. Still, the running game in general is not where McCarthy and the Packers would like it to be. McCarthy noted the overall attempts are low as a result of a poor third-down conversion rate. By the same token, the third-down conversion rate is low in part because of more third-and-longs created by the struggles in the run game. McCarthy emphasized that the run blocking needs to improve, and that’s across the board, including the tight ends, fullbacks and receivers, as well as the offensive line. Click here for Packers.com’s report following practice and locker room interviews.